As recently as just one generation ago Venice was a night city, where the residents of each parish set out tables on the street at the flimsiest excuse. Nowadays, with the pavements overrun by outsiders, the social life of the Venetians is more of an indoor business - a restaurant meal or a drink with friends might feature in most people's diary for the week, and a conversational stroll is certainly a favourite Venetian pastime, but Venice entertainment takes up most time and energy. That said, Venice's calendar of special events is pretty impressive, with the Carnevale, the Film Festival and the Biennale ranking among the continent's hottest dates. To find out what's on in the way of concerts and films, check Un Ospite di Venezia , a free bilingual magazine available from the tourist office and some of the more expensive hotels - it's produced weekly in peak season, monthly in winter. Information and listings for bars, events, festivals can also be found at. 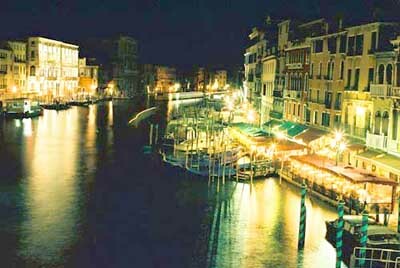 English-language films are the basic fare for Venice's moviegoers, and virtually every screening is dubbed rather than subtitled. From around mid-July to the end of August, however, an open-air cinema in Campo S. Polo shows dubbed or Italian-language films to a high-spirited local audience.